Welcome to Granville German Shepherds! Granville German Shepherds' mission is to produce high quality, intelligent, versatile working German Shepherd Dogs. Our breeding dogs are thoroughly health tested by qualified veterinarians and specialists, and results are shared with organizations such as the Orthopedic Foundation For Animals (OFA) to aid in the prevention of illness and disease for future generations. Our breeding dogs are trained, shown, and titled in a variety of activities that allow us to see their strengths and weaknesses. We try to keep an open mind approach to our breeding program, and believe that a good dog is a good dog, regardless of pedigrees (lines), titles, or color. We feel that it is extremely important to maintain genetic diversity within the breed, looking at the whole picture rather than focusing on single aspects, be they health, structural, color, title, or pedigree related. We began breeding at Granville German Shepherds in 2009 and are very proud of our progeny. They can be seen under the Breeding and Accomplishment tabs above. Here at Granville German Shepherds, we are currently or have been members, in good standing, of several dog clubs and organizations including: The American Kennel Club (AKC), The United Kennel Club (UKC), The German Shepherd Dog Club of America (GSDCA), United Schutzhund Clubs of America (UScA), The German Shepherd Dog Club of America - Working Dog Association (GSDCA-WDA), The German Shepherd Dog Training Club of Chicago, The United German Shepherd Dog Alliance, The Tracking Club of Wisconsin, BC Boomerangs Flyball Team, K9 Athletics Flyball Team, On The Border Herding Club, Kay-9 Petiquette, and Hide and Squeak Barn Hunt. 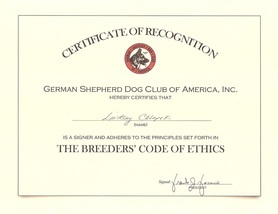 We are also signers of the GSDCA Breeder's Code of Ethics and an AKC Breeder of Merit. Our dogs are primarily Handler/Owner Trained. This allows us to discover each dogs' strengths and weaknesses. That being said, there's not enough time or money to train and title everybody at once, so just because our dogs are not trained or titled in a certain sport doesn't mean they cannot perform well in those sports. We try to pick a favorite activity for each dog and focus on titling there. Our dogs are health tested for: Hip Dysplasia, Elbow Dysplasia, Shoulder OCD, Degenerative Myelopathy (DM), Thyroid Disease, Cardiac Disease, Luxating Patellas, Full & Correct Dentition, Multiple Drug Resistance (MDR1), Hyperuricosuria (HU), and Ocular Diseases (OFA/CERF).